Coming to college, I was most nervous about creating a space that felt like home whilst being so far from my loved ones and the place I grew up in. How could I pick up and move across the country to a place I did not know to live with people I hadn’t met? Though it wasn’t easy, the process was made easier during move in as I was setting up my bed. My mom arranged and rearranged my throw pillows and blankets 100 times as she saw my nervous face scared to be in this new place with new people. At that moment she did exactly what I needed her to make me feel at home, she pulled out my childhood stuffed animals, Gymboe and Courdy and put them on my bed. 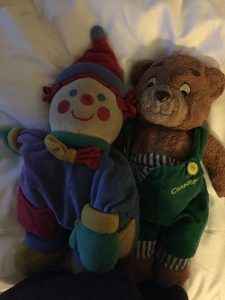 Though I’ve slept with them every night since I was a baby, I was nervous to be the 18 year old girl at college that sleeps with stuffed animals still so I hesitated bringing them along. My mom snuck them into her bag and I’m so thankful she did because they quite literally were my safety blanket and made me feel my bit of home and comfort in a totally new and foreign place. Having that piece of home with me was for sure the most indispensable thing to ensure a positive transition.